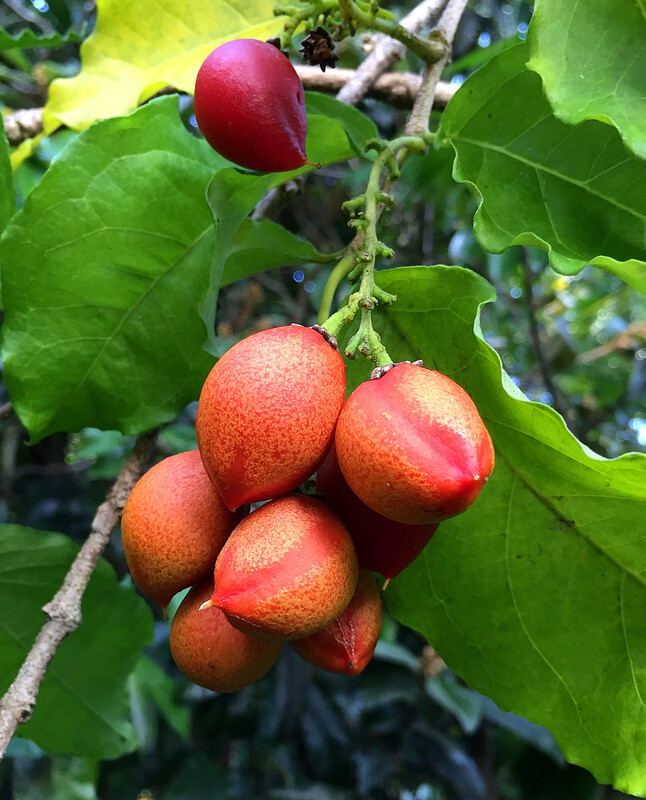 Mountain apple (botanical name Syzygium malaccense) is a beautiful fruit tree that grows in many farms and gardens in Hawaii, particularly on the rainy east side of the Big Island. 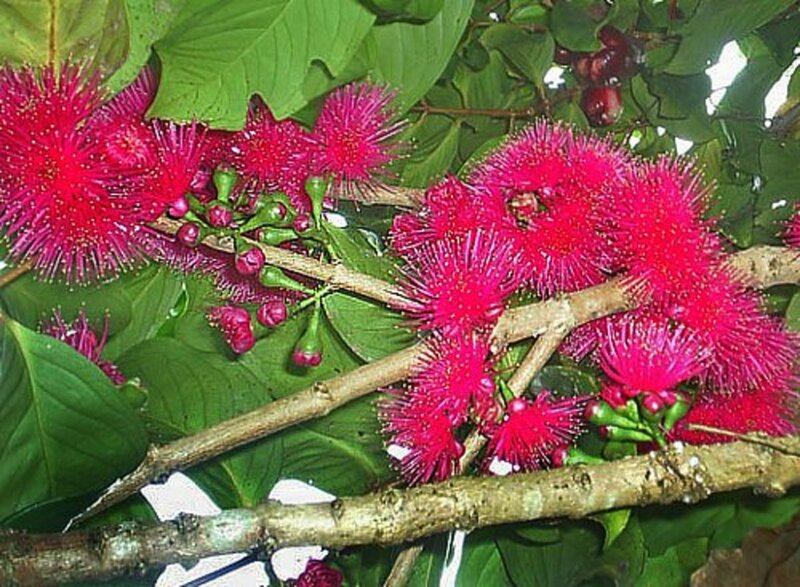 It has a Hawaiian name Ohi’a ’ai (oh-hee AH eye) and several other common names including Malay apple, rose apple, or water apple. Despite its name, it is not related to the mainland apple varieties that you see in the supermarket! The mountain apple fruit does have a waxy and shiny red skin (perhaps that’s why it has “apple” in its name), but its bell-shaped body and unique taste have no resemblance to any apples of the western world. 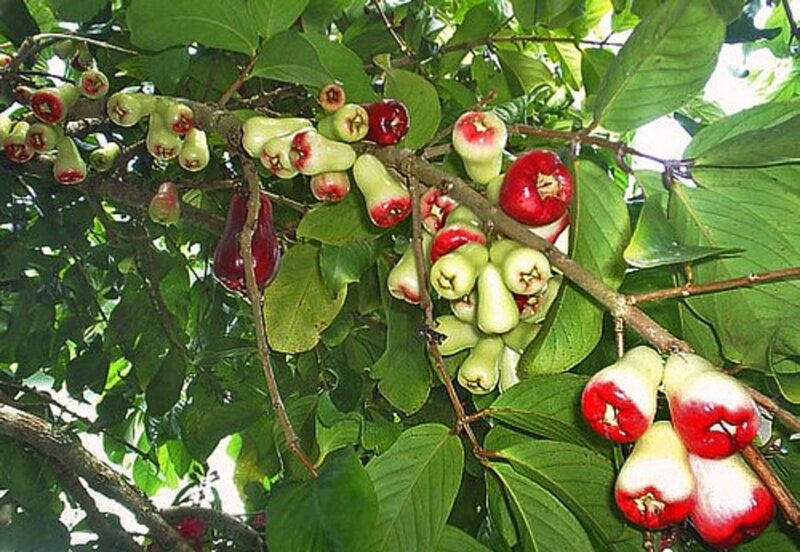 Mountain apple is not a native species of Hawaii. It originated from Malaysia and has been widely cultivated throughout Southeast Asia, India, Central America, the Caribbean, and many tropical island countries in the South Pacific. The Polynesian voyagers were credited for introducing mountain apples to Hawaii when they first discovered the islands centuries ago. Mountain apple is a fast growing tree and could reach 50-60 feet when mature. 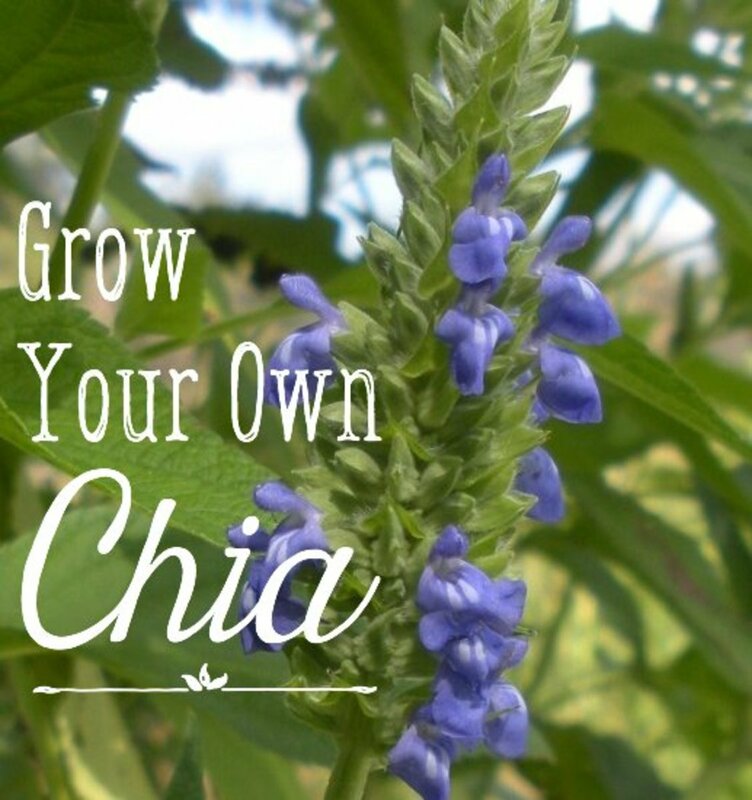 It can be grown easily from seeds (they germinate almost immediately in humus rich soil) and cuttings or air layering. On the Big Island, it thrives in areas that have abundant rainfall and humidity, such as Hilo and Pahoa towns or the lush Waipio valley. 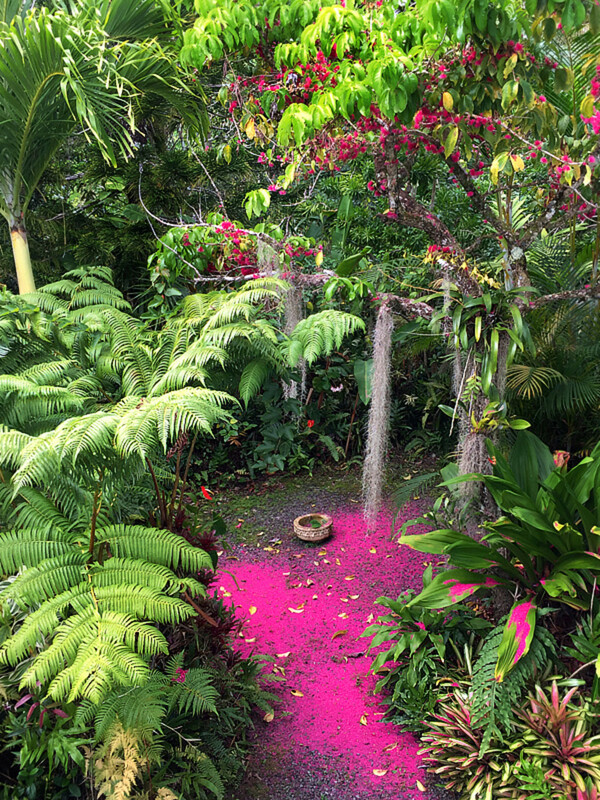 It can be seen growing in the wild wherever birds and animals have scattered its seeds: in the middle of a rainforest, at the bottom of a ravine, or alongside the many waterfall streams around the island. In Hilo, it is common to see a large mountain apple tree covered with hundreds of fruits in someone’s backyard and very often an entire branch will snap off because of the fruits’ weight! It is a magnificent sight to see a mountain apple tree in bloom. The flowers have a deep magenta-crimson color, with tiny gold specks dusting the tips of the stamens. They look like clusters of mini exploding fireworks! 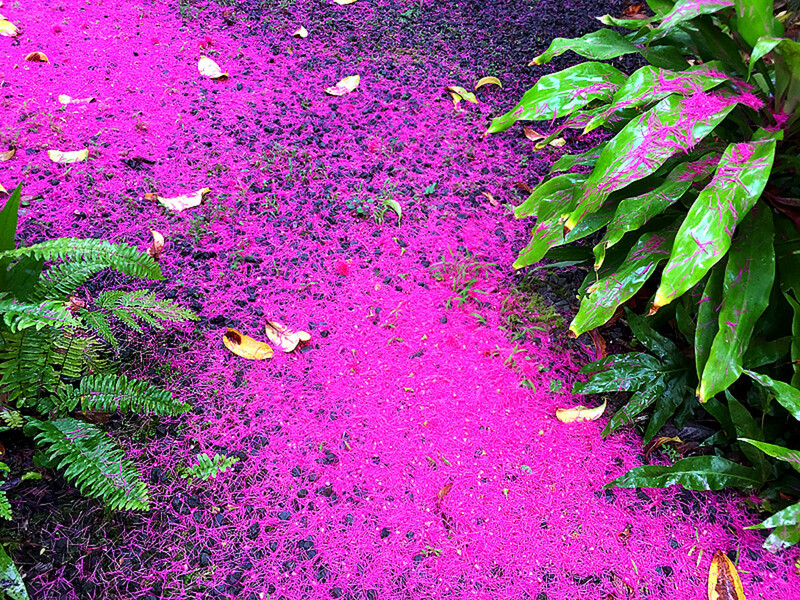 The lightly fragrant flowers sprout abundantly along the woody branches (or even on the main trunk) and when falling, they transform the ground underneath the tree into a glorious pink carpet! After flowering, the tree bears fruits which are light green when young and turn bright to dark red when they are ripe. 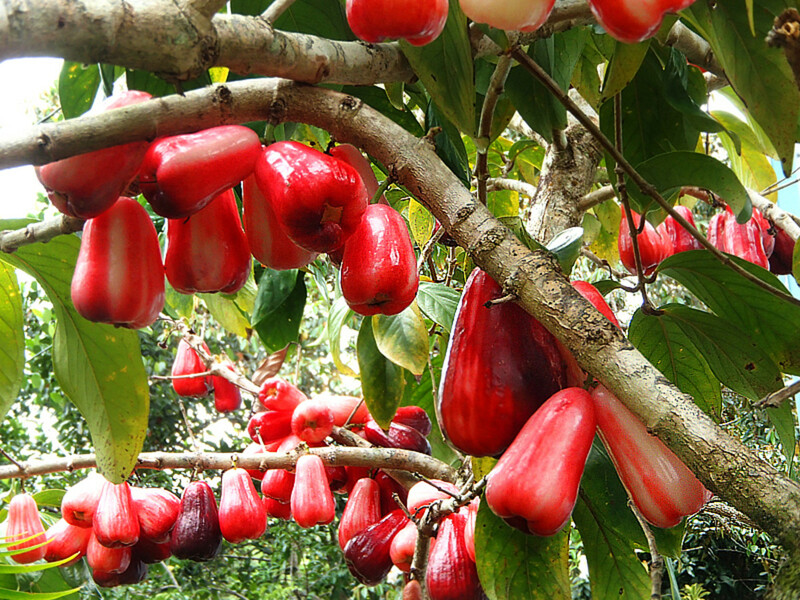 If left on the tree, the ripe fruits will eventually change into a dark burgundy color and then drop to the ground. This creates a messy problem as the smashed fruits ferment and attract hordes of fruit flies! There is also a less common white variety of mountain apple growing in Hawaii, in which the trees bear lovely white blossoms (with a stronger fragrance) and delicate white fruits. A ripe mountain apple fruit tastes sweet and very juicy. It also has a distinct rose flavor. The flesh is soft and slightly crunchy. Each fruit typically has one (sometimes two) small round seeds inside. You don’t have to peel the skin, just bite into the fruit as if you are eating a…well, apple! 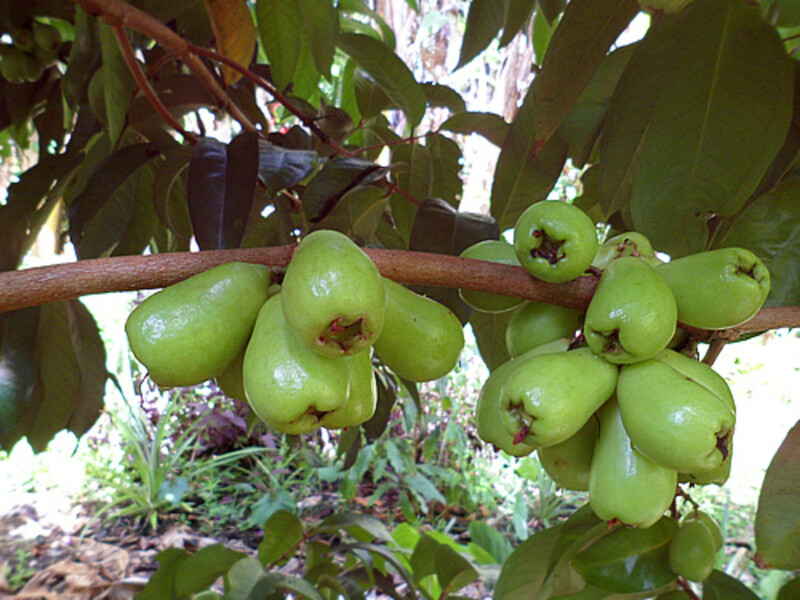 Mountain apple is a major commercial fruit crop in many Southeast Asian countries (e.g. Indonesia, Vietnam, Thailand, and the Philippines) where farmers stack the bright red fruits into big piles and sell them at open air markets and fruit stands along the roadside, or transport them on little sampans heading to the floating markets. Visitors to Hawaii can find mountain apples at farmers markets between August and September when the fruits are in season. They are rarely sold in supermarkets because they tend to bruise and deteriorate quickly even in refrigerated temperature. In Hawaii, mountain apples are usually eaten fresh or made into jams and pickles. Local people also like to make a syrupy sweet wine out of the over ripened fruits. When cooked with fresh ginger, lemon juice, cinnamon and then smoothly processed in a blender, they make a delicious mountain applesauce. The colorful mountain apple blossoms are also edible and they add a delightful touch to soups or salads when used as a garnish. Wash the mountain apples and pat them dry with a paper towel. Cut each fruit into half lengthwise, discard the seeds and trim both ends. Cut across each half into thin (about 1/8” thick) slides. In a bowl, toss mountain apple slices with lemon juice, garlic, chili pepper, salt and sugar. Spoon everything into a sterilized glass jar and close the lid tightly. Refrigerate for at least 2 days and enjoy! 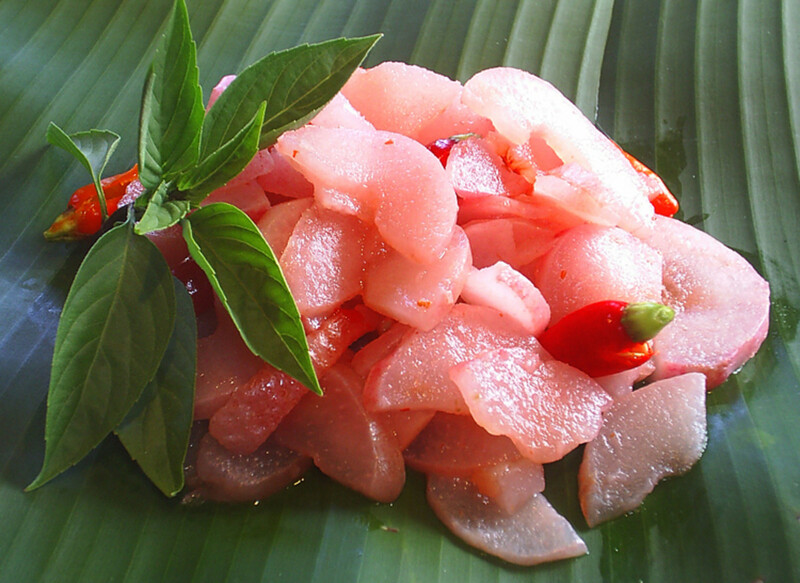 Pickled mountain apple is excellent with grilled fish or meat. It can be served by itself as a sweet and spicy appetizer or a side dish to accompany curry or sushi. The author is very grateful to have 2 mountain apple trees on his property. He loves eating the fruits right off the branch! All photos were taken in the author’s garden and kitchen with a Samsung Digimax 301 3.2MP camera, an Olympus Stylus TG-630 iHS digital camera and iPhone6. I bought a bag of fruit at the farmer’s market on Oahu. The fruit looks just like the mountain apple I grew up with. It’s bright red, but not juicy. It’s crispy & tastes a little lemony. What could it be? As far as I know, there are several varieties of mountain apple. Some are juicier than others. Some are white or dark purple instead of red. Here in Hawaii, I've seen mountain apples in all sizes and shapes, including tiny ones about the size of your thumb! How many years before Mountain Apple tree will start to give fruit? Will mountain apples grow anywhere on the mainland of Hawaii? Mountain apples are a tropical fruit tree. It will not grow "anywhere" in mainland, but Maybe in FL or southern CA. It needs a lot of rain, as well as hot, humid weather year round. Unless you have a greenhouse to shelter the plant in the winter months, it will not survive cold weather. It is not related to the regular apple that you have in mainland which can tolerate cold freezing temperature. Do mountain apples grow better on tall or short trees? Here on the Big Island, I have seen both tall and short mountain apple trees with tons of fruits! So, I don't think it matters, as long as the tree is happy and healthy, it will produce fruits. However, short trees will make it easier to pick the fruits. Do you have any tips on growing mountain apple from seed? Can I just plant it into the ground? 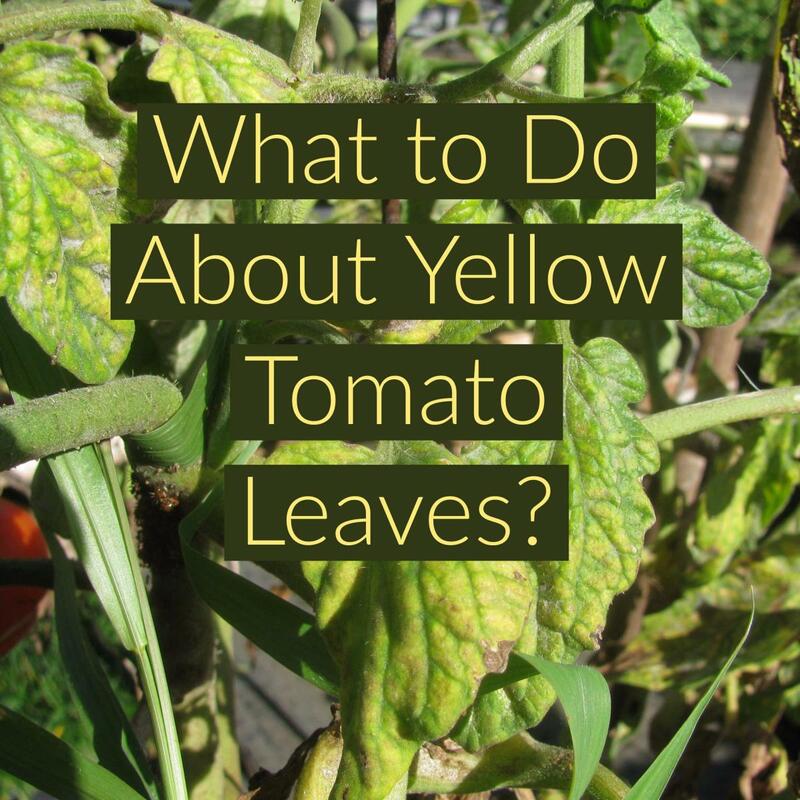 Does it require a lot of water or sun? Depending on where you live, mountain apple seed can be planted directly into the ground or a one-gallon pot first, then transplanting the three or four-month-old seedling into the ground later. Here in Hawaii, seeds from fallen fruits usually sprout quickly and grow happily underneath the mother tree! I have to weed these young plants out every year to keep them from getting bigger! Mountain apple loves full sun and plenty of water. I live in Oahu. My neighbor has a white mountain apple tree. My neighbor is 74, and I want to help her, but I don't know anything about this plant. The leaves are being eaten. Could you help me, please? Some bugs like to eat mountain apple leaves. I have seen this problem on my mountain apple trees. The leaves must be quite tasty to them! However, I'm an organic gardener, and I don't use chemical poisons or insecticide in my garden. If the bugs like to eat the fruits or leaves on my trees, I let them have it. There's always plenty to share! Occasionally, if the bugs are getting out of control, like an infestation of aphids, spider mites or mealy bugs (very common in Hawaii), I would mix up a concoction of neem oil, water, and dish soap, and spray it on the plants. It works really well. Neem oil is made from the fruits and seeds of the neem tree which is originated from India. It's a natural insecticide and bug repellent. You can buy neem oil at many garden centers like Home Depot, Walmart, or local nurseries. 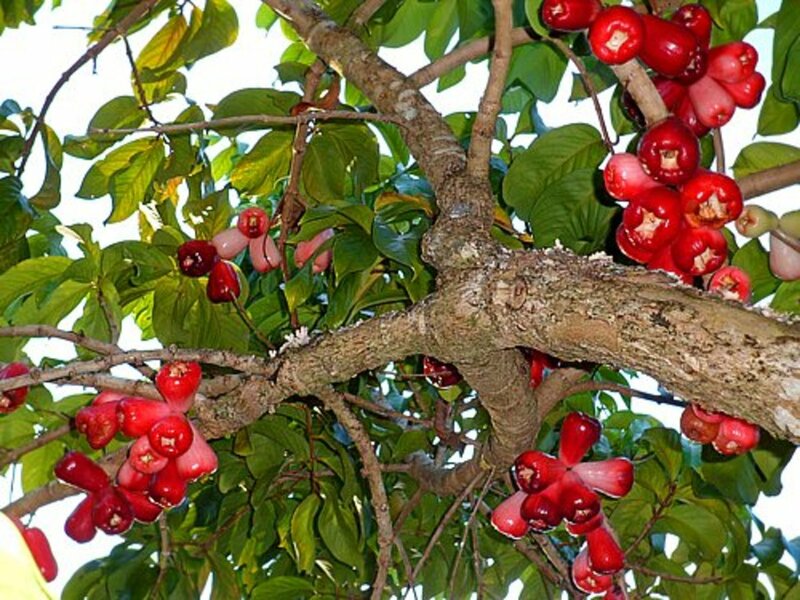 How do mountain apples relate to Hawaiian culture? A mountain apple is one of those canoe plants that ancient Hawaiians or the original Polynesians brought to the islands of Hawaii centuries ago on their canoes during their many voyages across the Pacific Ocean. Other canoe plants are taro, breadfruit, banana, sugarcane, ti, kawa, etc. Do you have a recipe for making mountain apple wine? No, I don’t have a recipe for making mountain apple wine. Can mountain apple grow in Florida? Where can I purchase a plant? Mountain apple may grow well in Florida, but it will not survive those occasional freezing spells that Florida has in the winter months. Check your local nursery for how to get a plant. Can mountain apples be ripened off the tree? Yes, you can pick fruits that are not fully ripen and let them sit on kitchen counter for a couple days, then they will be ready for eating. I read that mountain apple is very good for people with diabetes. How can I get mountain apples shipped to Ohio? How interesting, I'm not aware of the diabetic benefit of mountain apple! But I know it cannot be shipped from Hawaii. You might be able to find fresh mountain apples for sale at Asian markets in southern California or Florida. Or take a trip to Hawaii! Can I order Mountain apples online and have them delivered to the U.S.? Mountain apple fruits are highly perishable, and will not survive in shipment containers. 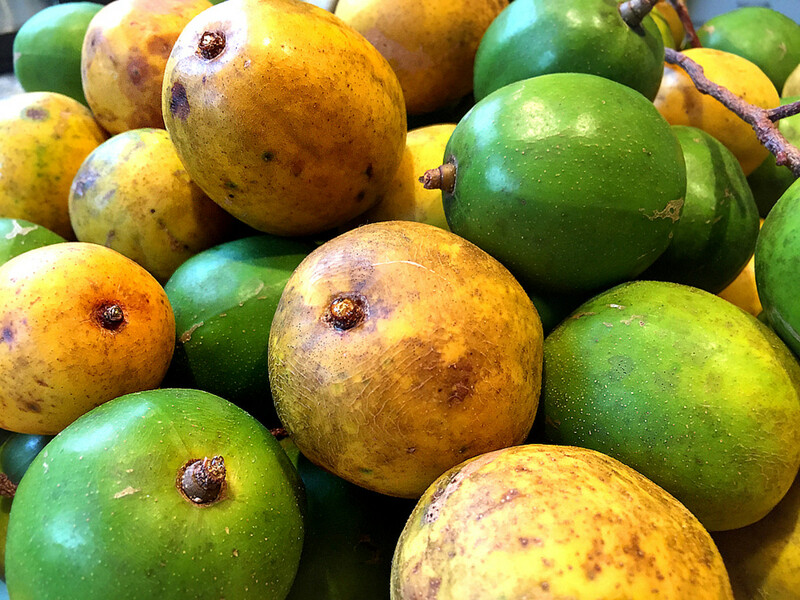 Therefore it is impossible to ship the fruit to mainland U.S. You will have to visit Hawaii or other tropical countries like Thailand or Vietnam to try the fruit. 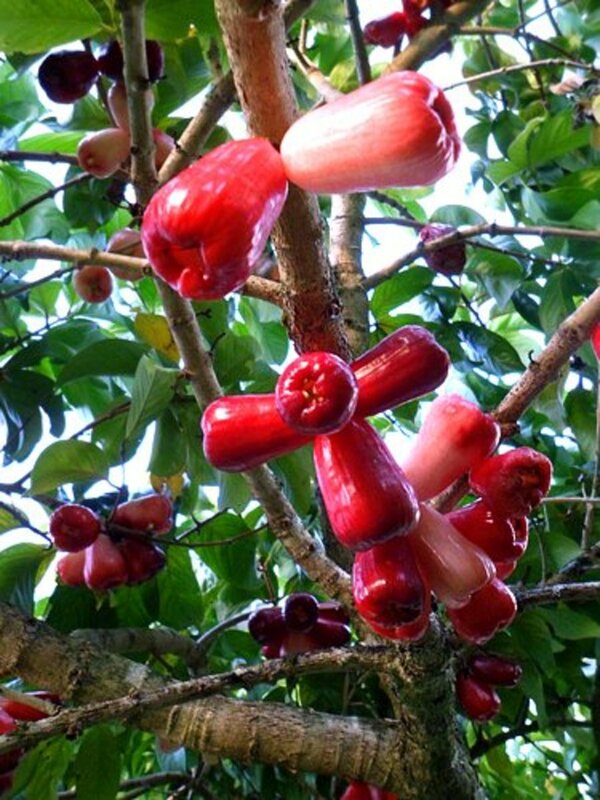 I used to eat these mountain apples on the island of Kauai. We had a secret place (back in the 1960's) along the main highway where we'd stop and have a treat before going home. I haven't had them since leaving the islands. 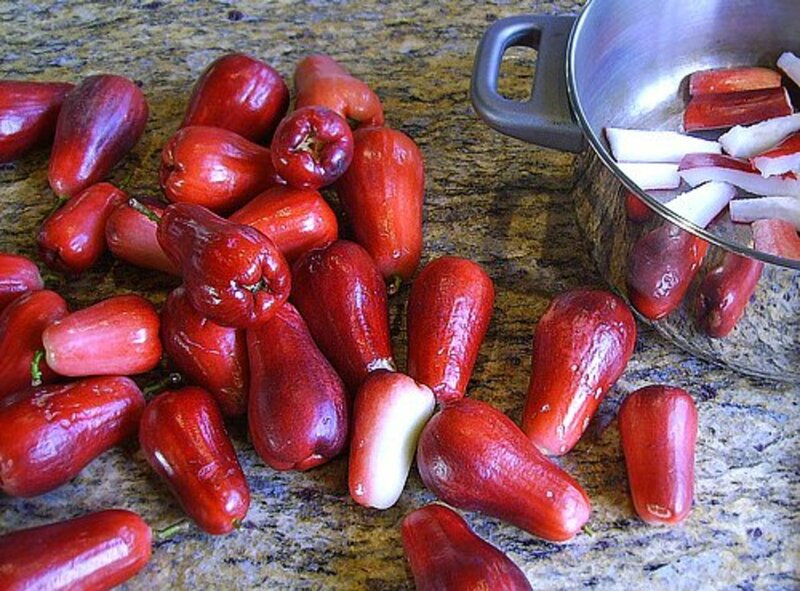 I make homemade wine with the local fruits and veggies so I was wondering if anyone in the state of Hawaii has made any homemade with these mountain apples. Your web page looks mighty inviting and it reminds me off how juicy and sweet these ohi'a 'ai are. Thank you for sharing your apples. The pickled mountain apples taste great! I love your article! I have so many questions, as our tree is starting to have blossoms! Is it normal for the blossoms to fall off? Or does that mean they are dying? How much should I be watering the tree? Beautiful hub! I had never heard of this fruit. I like how you explain its properties from blossoms to ripened fruit. I hope I get to try one someday! Thanks for this interesting piece. What beautiful and colorful pictures! I also enjoyed the unique topic! Another amazing reason to visit Hawaii! Congrats! Congratulations on HOTD! 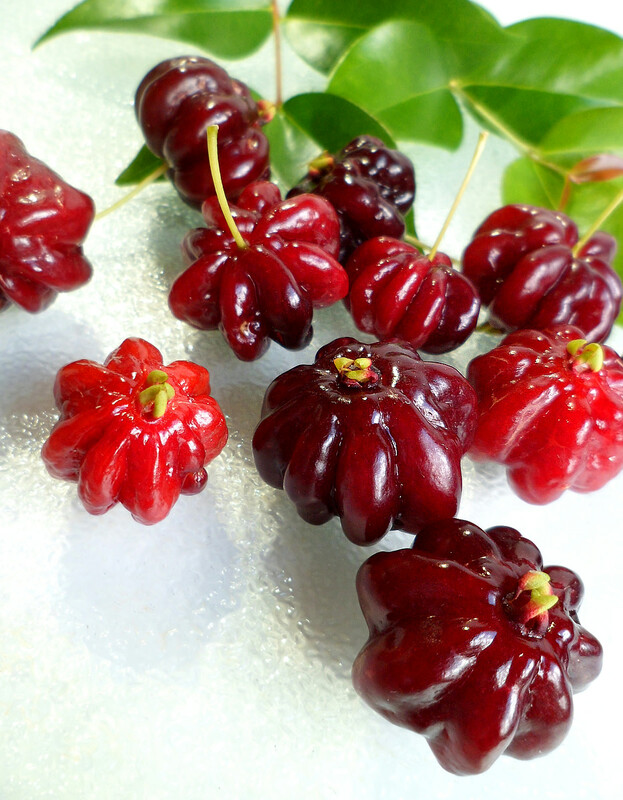 I've seen these fruit for sale in Asia, never known what they are - now I do. thank you. Back to say congrats on your Hub of the Day award! Viet, lovely photos for this hub. Those mountain apples are beautiful, too. I always wanted to go to Hawaii someday. Congrats on HOTD! I was not aware of the mountain apple before reading your hub. They are indeed mouth watering and you are fortunate to have it around your home. Thanks for sharing this interesting information and the beautiful pictures! Can you eat mountain apples while still small & green? My mountain apple trees are fruiting right now, the fruits will be fully ripen in the next few weeks. In Hawaii, mountain apple season is June-August. US Dept of Agriculture does not permit fruits/plants from Hawaii to be shipped to mainland. You just have to plan a trip to Hawaii to taste the mountain apples and other tropical fruits that you mentioned. Aloha! 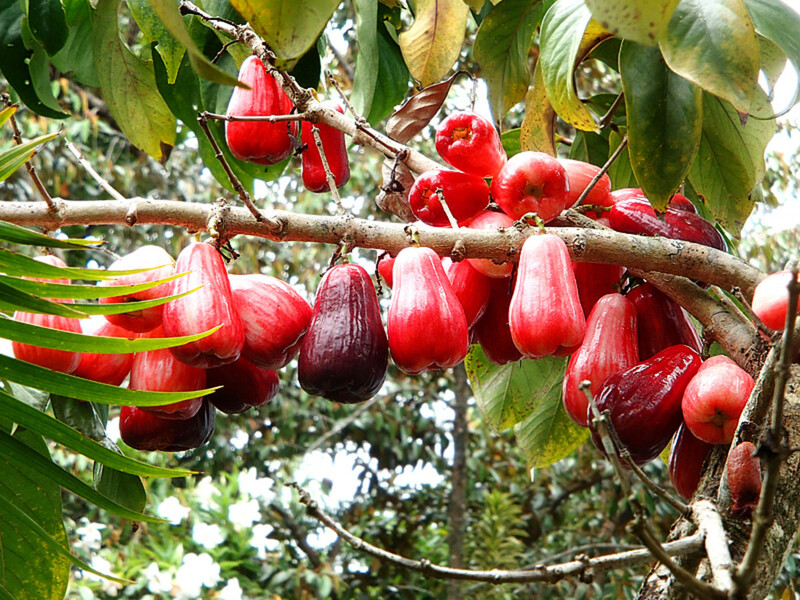 Some sources say that Mountain Apple and Rose Apple are two different fruits. Others say that its one and the same fruit. 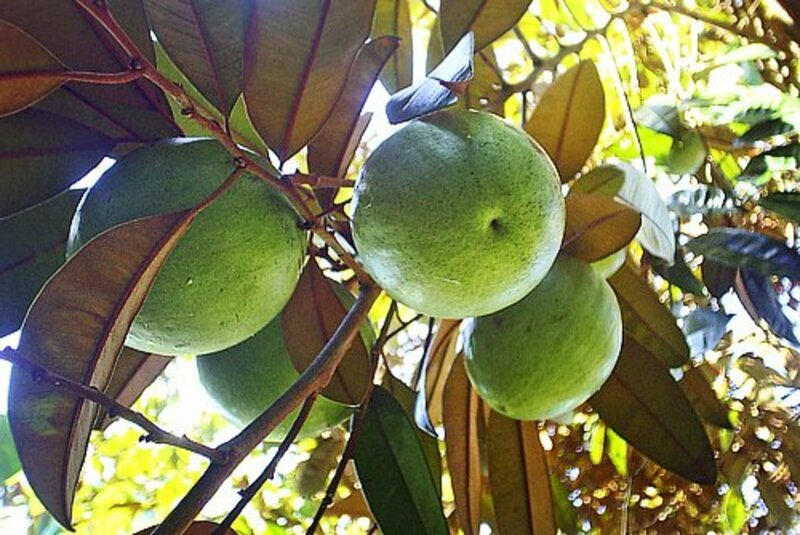 How long does Mountain Apple ripen in the wild state in the Hawaiian Islands? 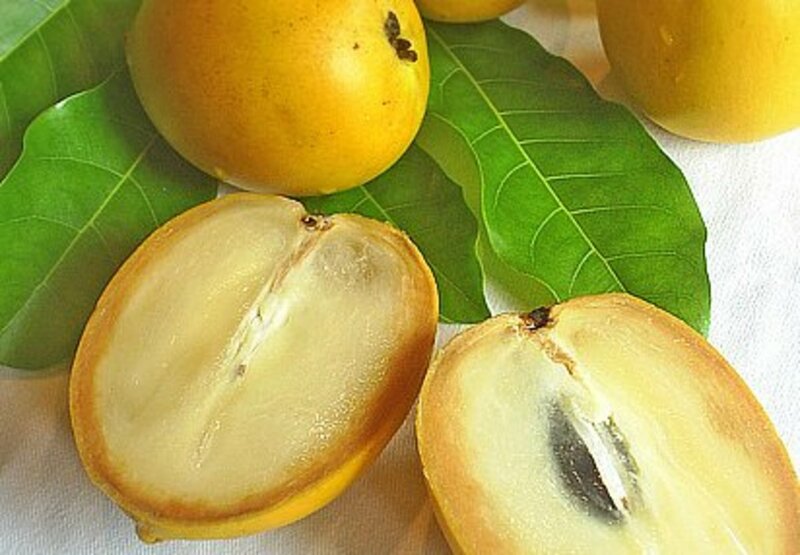 What months or what seasons is Mountain Apple ripe in Hawaii? I have not found this fruit in grocery stores where I live. Can I order Mountain Apple through the mail and have it shipped to my house? I live on the mainland United States. I would like to order Mountain Apple Java Plum Strawberry-Guava Rambutan and Custard Apples such as Sweetsop and Guanabana. Banana poka sounds delicious too. Thanks for stopping by IslandBites! I hope to visit Puerto Rico some day. Sounds like we share a lot of common tropical fruits, very cool! In Puerto Rico, we call it pomarrosa. I remember that my grandma used to have a tree, but I never like them. Thanks Gail! Glad you get to know about this fruit...Aloha! I have never seen these before. Voted up and shared. It's amazing that you have this same wonderful (very juicy watery indeed!) fruit in Bangladesh. Thanks for telling me its name, I will remember it. Aloha! Yes it's a wonderful fruit. Great as a snack too! Glad you enjoyed the hub. Aloha! That is one of my favorite fruits. It has a sweet aroma too. Thanks for stopping by to read my hubs too. Thanks funmontrealgirl. Working in the garden yesterday, I saw one of my mountain apple trees is fruiting again. Yeah! Stephen shared your writing with me - very nice! I was just there on the Big Island with my son Evan. We drove through Puna and as usual, it was gorgeous. Hope to see you someday when I'm visiting again. Aloha! Thanks RTalloni and rainmist. Thanks for the vote BWD316. Glad you guys enjoy the hub. Wish I could send you each a box of mountain apples. Aloha! great hub! very cool tree, nature is filled with such useful and beautiful beings. Im craving a mountain apple now, after reading your post, too bad im no where near a tropical island! voted up! This tree and its fruit are amazing. Thanks for sharing info about the Ohi’a ’ai.